In the 1946 film adaptation of The Big Sleep, ace detective Philip Marlowe famously quips, "Such a lot of guns around town, and so few brains ... you're the second guy I've met today that seems to think a gat in the hand means the world by the tail." The line, delivered by Humphrey Bogart in his inimitably sarcastic style, speaks volumes about the noir genre - not to mention the videogaming world's sadly mistaken interpretation of it. Noir, at its heart, is about atmosphere. An atmosphere described by Taxi Driver scribe Paul Schrader as "fatalistic, hopeless." Protagonists often find themselves betrayed (Double Indemnity), murdered (The Killers) or usually some combination of the two. Yet for all the corruption and death, noir often remains astonishingly low on violence. Classic noir protagonists like Sam Spade do indeed carry guns during many of their cases, but for all their skill, they might just as easily go unarmed - the ultimate strength of Marlowe, Spade, Hammer or The Continental Op is their intelligence and their ability to think three steps ahead of their enemies, rather than their efficiency in committing violence. Even the novels of Mickey Spillane, formerly considered one of the trashiest writers in the genre, rarely contain body counts reaching double digits. Yet setting aside the considerably large detective noir genre, the other subsections of noir (insurance noir, blackmail noir, infidelity noir) share an equally strong respect for atmosphere and thought over violence and gunplay. Films like Key Largo or stories like Blackmailers Don't Shoot concern violent people and situations, but focus much more heavily on characterization, mood and thoughtfulness than outright gun-blazing action. But today, there are a considerable number of videogames that define themselves as "noir" with little or no respect for the source material from which they take their namesake. Self-professed "noir" titles like Max Payne or The Darkness take the aesthetic sensibilities of noir but utilize gameplay much more evocative of a John Woo film than a Dashiell Hammett paperback. On the surface, it would seem like Max Payne 2 has all its noir bases covered: It contains a brooding, isolated detective hero; a duplicitous love interest; a dark and grimy version of the New York underworld; and a heapin' helpin' of omnipresent voiceover narration. Max Payne himself is a character whose inner demons might initially seem reminiscent of a protagonist in a James M. Cain novel. This makes it all the more tragic, then, that the aesthetics are the only noirish thing about the game. Max Payne walks the noir walk and talks the noir talk, but he is, for all intents and purposes, a balls-out action hero: Max's strength as a character is measured in bodies, and his skill as a detective never goes any further than the skill with which he aims a gun. As fun as it is to dive through the air in bullet time and blow away hundreds of men in ski-masks, it is most assuredly not what the noir genre is built on. Payne, to put it simply, is Woo in Chandler's clothing. This isn't to say it's impossible to create a true noir game - quite the opposite. There is one genre that has repeatedly and somewhat efficiently utilized noir's sensibilities beyond their simple visual attractiveness: the adventure game. Whether collecting clues as an anthropomorphic crime-fighting duo or traversing the globe as an American tourist turned murder witness, adventure games have almost always prioritized thought and planning above force and rash acts of violence. 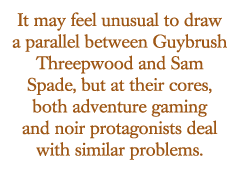 It may feel unusual to draw a parallel between Guybrush Threepwood and Sam Spade, but at their cores, both adventure gaming and noir protagonists deal with similar problems (namely, mysteries and murders) and must handle them in nearly identical, thoughtful ways.